Academic Career: CGS 1893 – 1898 Head Master’s Scholar, 1895. Queen’s Coll.,Oxford, 1898; Hastings Exhib. in Classics, 1897;3rd Class Clas. Mod., 1900; B.A. (4th Class Mod.Hist. ), 1903. Colonial Civil Service. [toggle title=”Family Background”]Family Background: Hugh was the second child and eldest son of 15 children born to Captain William Blakeney Persse Trousdell, of Cobtree,Boxley, Maidstone, Kent. Three of his brothers also attended Carlisle grammar school. All four served during the Great War: Hugh and Charles were in Nigeria; John in India; and Maurice was fighting in Belgium. Hugh’s fiancee was Sybyl (which is how she spelt it) Thesiger. She was the sister of the explorer and author Wilfred Thesiger and grandaughter of Lord Chelmsford (Anglo-Zulu War). Boxley is the village near Maidstone where Hugh’s Whatman (maternal) grandparents lived. In their visitor’s book it shows she stayed with them in 1915 on January 30 and then from March 5 March 15. This overlapped with Hugh’s brother Maurice who stayed there from March 9 – March 19 1915. Hugh himself stayed there onMarch 25 before he set off to Euston the next day to catch the boat train to Liverpool. At Queen’s, Hugh had an interview with the Provost who recorded notes on him: ‘ …healthy & strong, played cricket & a little football, hockey, intends to row, fishes & shoots, cannot sing or play, debated & national history society, hopes to get into Civil Service…” Hugh played hockey at university. Throughout his time at college he was a member of the university volunteers. [toggle title=”War Service”]War Service: Hugh went out to the South African War in 1901-2 and was awarded a medal.He then went to work for the Colonial Service in West Africa. [toggle title=”Other”]Other: He was appointed a clerk in the colonial audit department in June 11 1904. The following year he received an overseas posting, and assumed his duties as assistant auditor at Calabar on July 7 1905, making a journey up the Cross river in November and December. From January to July 1906 he was based at Bonny and sailed for England on his first leave aboard the S.S. ‘Sekondi’ on July 13. Hugh arrived at Bonny for his second tour of duty on January 3, 1907. He returned to Lagos as acting local auditor on February 17 1908, and was transferred to the treasury as a financial assistant 2nd Grade on July 26 1908, promoted to 1st Grade January 1 1910. 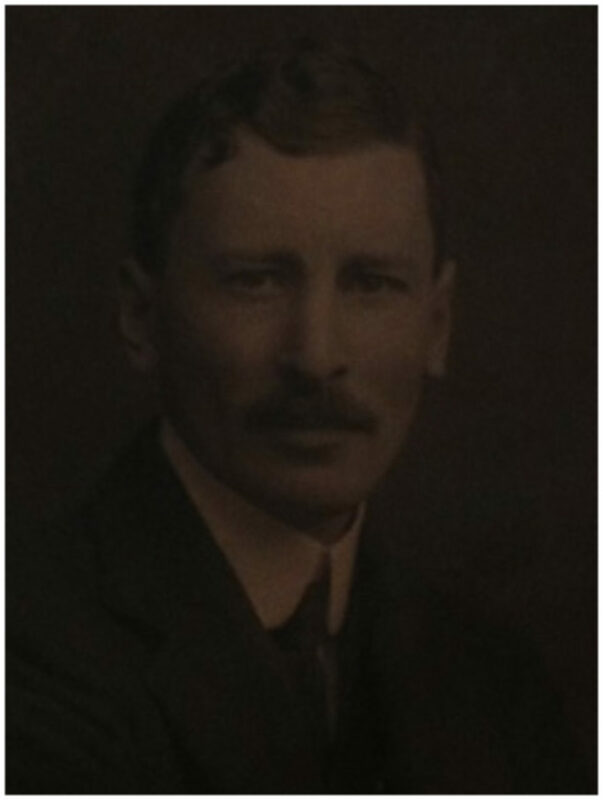 Prior to the amalgamation of Northern and Southern Nigeria on January 1 1914, Hugh was appointed chief accountant of the combined Railway Department. His photographs are contained in the Janus Collection. It is with deep regret that we have to announce the death, at the age of 36, of William Hugh Cornwallis Trousdell, which took place on Palm Sunday. He was returning to Northern Nigeria, on board the S.S. Falaba, when that vessel was torpedoed by a German submarine off the coast of Pembrokeshire. Hugh Trousdell was the eldest son of Mr. W.B.P. and Mrs Trousdell of Maryland in this parish, and grandson of the late Mr. and Mrs. Whatman of Vinters. He was born January 9th, 1879 and at the age of 9 obtained a Randall Scholarship at the Maidstone Grammar School, Mr. Crosthwaite then being Head Master. Later he went to Mostyn House, Park Gate, Cheshire and finally he rejoined Mr. Crosthwaite at Carlisle, Mr Crosthwaite having left Maidstone and being Head Master at the School at Carlisle. It was my privilege to have known Hugh Trousdell, and to have met others who knew him far better than I did, and our unanimous opinion of him is that he was a Christian, an Englishman and a Gentleman, the three most honourable positions, higher than these you may not hope on earth to go. As a Christian he realised that the Catholic faith, the watchword of christendom, had broken down the barriers between nations and families, had brought before the world the idea of universal right and of absolute justice. As an Englishman he realised that he was of that race who have known best how to mingle obedience with liberty, how to conquer with valour, to rule with justice and to spare in mercy. As a Gentleman he realised that he had received by inheritance the highest cultivation of a Christian English nature; which surely means cultivation of the powers of the mind, training of the powers of the heart, curbing of violence of temper and the careful nurture of the body. I cannot conclude without offering to the members of the Trousdell and Whatman families, and to his fiancée, Miss Sybil Thesiger, the deepest sympathy from all who live in Boxley, Grove Green and Weavering Street. A Memorial Service was held in Boxley Church on Wednesday, April 7th, which was well attended by many parishioners as well as by relatives and friends. Portions of the Burial Service were read and the lessons for All Saints’ Day. Psalm XC. and the hymns “Lead, kindly Light,” “Brief life is here our portion,” and “Christ will gather in His own,” were sung. The service was very impressive. In the evening a half-muffled peal was rung on the church bells. Actually The Southern Nigerian Regiment into which he was “gazetted” (in the Southern Nigeria “Gazette”) as a 2nd Lieutenant on 28th June 1911 by Alexander George Boyle the Acting Governor and Commander in Chief who signed his commissioning certificate on 2nd August 1911.